Simón Bolívar was Colombia's first leader. Simón Bolívar was Colombia’s first leader. The liberator rode from region to region, a freedom run that birthed five countries in territories once under Spanish rule. You’ve heard their names: Bolivia and Perú, Ecuador and Venezuela, and, of course, Colombia. All over Colombia, you see Simón Bolívar’s name, see something to remind you of him. The department for which Cartagena is the capital is called Bolívar. A monument pays tribute to him in Santa Marta, where he died in 1830 of tuberculosis after serving more than 11 years as president of what was then Gran Colombia. In Bogotá, the plaza where you find the Capitol and the main cathedral is named after him. 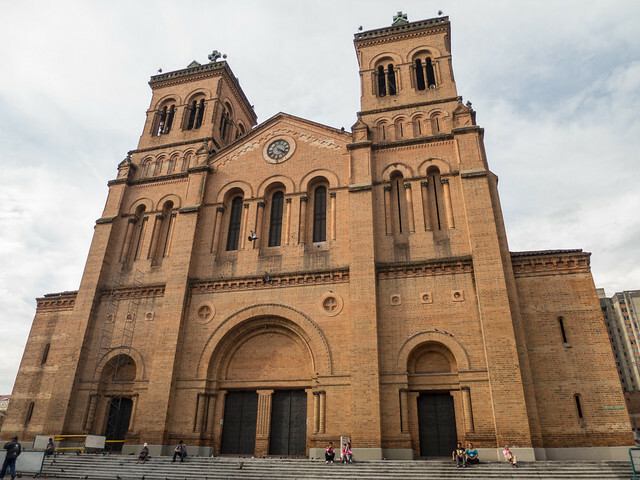 And in downtown Medellín, Parque Bolívar features a statue that commemorates him in front of the Catedral Metropolitana. Parque Bolívar is one of the city’s oldest, if not the oldest, as the people I’ve talked to have confirmed what I’ve read, that the park and cathedral have been there since the late 1800’s. The statue apparently came later, in the 1920s. My favorite part is not the statue itself, Bolívar gallant on his galloping horse. It’s the engraving on the left side of the base. Quisiera tener una fortuna material que dar a cada Colombiano, pero no tengo nada. No tengo mas que un corazón para amarlos y una espada para defenderlos. I would love to have material wealth to give each Colombian, but I have nothing. I have nothing more than a heart to love them and a sword to defend them. It is one of the city’s prettiest parks, with that huge fountain hurling water toward the sky between the church and the statue, and a handful of benches to just sit and watch people pass, many of them in the shade of the park’s many trees. The best time to go is during the day. It’s a little dodgy at night. The monthly Mercado de San Alejo. This past week, I went to see it again for the first time in a while, since my sister came to visit in November/December. Like other parks, you can get your shoes shined if you need, and I did. It was only 1,000 pesos (about 53 cents), way less than it should cost, so I left the guy an extra thousand. While I was sitting there, I was thinking about the time I went there to see the Mercado de San Alejo, an exhibit of arts, crafts and games on the first Saturday of every month, and how I ate a pretty decent set lunch for less than 3,000 pesos at Cafetería La Estancia, across the street from the southwest edge of the park. I still need to stop by on a Sunday, when a band from the Universidad de Antioquia plays classical and folk music. This does not count as classical but it’s definitely a classic. I saw a man wearing a New York Mets jersey and carrying a little boom box blasting “Every Little Step” by Bobby Brown. Hadn’t heard that song since 6th grade. I didn’t know Colombians listen to Bobby Brown. I didn’t know anyone still does. Then afterward, my tendency to be clumsy kicked in and I stepped in some wet cement near the south edge of the park as I waited to cross the street. To be fair, there was nothing blocking the area, but I should have been more aware, considering there were workers nearby. I guess I was daydreaming. I know I was embarrassed. I fled my shame by heading down Pasaje Junín, the pedestrian walkway full of shops and restaurants that stretches two big city blocks and ends where the park begins. If Bolívar was watching from above, I’d like to think he forgives me. The footprints I left behind are not as big as his. Parque Bolívar and Pasaje Junín, the pedestrian shopping corridor, collide downtown. Cafetería La Estancia is good, cheap and the cooks know how to prepare a good sancocho de bagre. BTW, I still listen to Bobby Brown…for nostalgic purposes only.